Research Notes Wendell Mohr lists birth year of 1869. 1900 census gives birth month of October. Elaine Schoelzel lists date of death as 26 May, but his obituary appeared in the 25 May edition of the Los Angeles Times. Research Notes Elaine Schoelzel lists marriage date as November 26, 1900. Marriage Licence number: 318982. [S257] Obituary of Rudolph A. Schoelzel. [S80] Obituary of Rudolph A. Schoelzel. [S36] Irving Park Cemetery burial records. 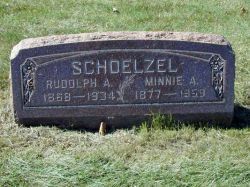 [S532] Marriage License of Rudolph Schoelzel and Minnie Knuth. [S52] Illinois Statewide Marriage Index, 1763–1900, Illinois State Archives & Illinois State Genealogical Society, License # 318982.